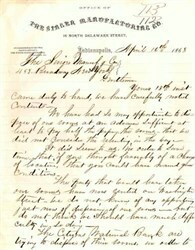 This is a Letter from one of the branches or agents of the Singer Manufacturing Company written in 1868 to the New York office. The letterhead will say Office of The Singer Manufacturing Company. You will receive a similiar letter as shown in the scanned image, although the content may differ. We have 14 different letters for sale at $29.95 each. This a great piece of history from a very famous company.